Looking for the best Cross Country Skiing trails around Sterling? Find the top rated cross country skiing trails in Sterling, whether you're looking for an easy short cross country skiing trail or a long cross country skiing trail, you'll find what you're looking for. Click on a cross country skiing trail below to find trail descriptions, trail maps, photos, and reviews. I saw a moose closeup on the wooded section of the coastal trail past the airport. The views of Anchorage and the mountain range across the water are breathtaking. Surface is smooth, it gets somewhat hilly at Earthquake Park (with a very interesting exhibit) and the airport runway. Mileage markers are somewhat confusing since mile 0 is not at the downtown terminus, but at Westchester Lagoon about 2.5 miles from the Alaska Railroad Depot, then runs along the water to the airport then through dense forest for another 9 miles or so for a total of 11 miles. Ran here in 2007 from Kincaid Park north.That was a great experience.In August,2016 while on vacation;I ran from Earthquake Park towards Anchorage one day and Earthquake Park towards the Airport the next day.This trail affords you views of snow capped Mountains,Cook Inlet,and miles of heavy forest lined with Birch,Aspen and other trees.Running towards the Airport is more hilly.I've run in hundreds of places in the USA due to work travel.This trail is one of the most scenic.Considering Anchorage's winters of ice/snow,the asphalt trail is in excellent condition.If you are in Anchorage,run this trail.You will be happy you did. Biked the Tony Knowles Coastal Trail 8-23-15. The weather was perfect -- sunny to partly cloudy and cool, with a slight breeze. The trail is beautiful -- meandering through and alongside residential areas, wooded parks, and the coastline. The tide was out, so numerous birds were feeding in the marsh -- saw several Sandhill Cranes, a bonus! Snow-covered mountains were visible in the distance. We could see Denali (Mt. McKinley to some) from Pablo's Bike Rentals on the corner of 4th and L Streets! A fairly rare sight. Pablo's Bike Rentals' pricing is comparable to others in Anchorage (see note below about bike rentals). There are a couple of steep hills if you're traveling the paved trail from downtown to Kincaid Park. Some folks choose to ride from Kincaid Park to downtown to lessen steep climbs. One of the most amazing experiences we had was stopping at the end of the runway at Ted Stevens Anchorage International Airport and watching the jets take off!! You could actually "feel" the plane as it left the runway and roared overhead. It was incredible! If you'd like a cool souvenir, Downtown Bicycle Rental, Inc. (333 W. 4th Avenue, Anchorage) has great bike jerseys designed specifically for Alaska and the Tony Knowles Coastal Trail. Cotton t-shirts are available, too. We had to have both! We will rent bikes from Downtown Bicycle Rental, Inc. next time we're in town. They are a wealth of knowledge and extremely helpful. We'll definitely make this spectacular biking trip, again. I highly recommend it to everyone who has an interest in biking or walking. Nice trail, saw moose right next to trail, very scenic. 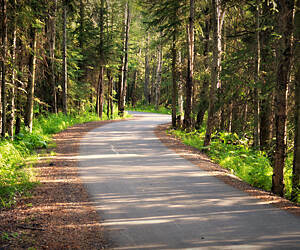 "My wife & I visited the Tony Knowles Coastal trail last summer. The very smooth asphalt trail was very scenic. The bay can be seen along most of the trail. The first 5 miles through Anchorage is about like any other USA city with the Anchorage skyline view while following the coast through the different neighborhoods. Suddenly, the next 6 miles we found ourselfs going through a wooded raw-wilderness area. My wife & I ran into three mooses that day. We had to wait for one of them to leave the trail before we could pass by. We also found Earthquake Park to be quite informative with the history of the 1964 earthquake. 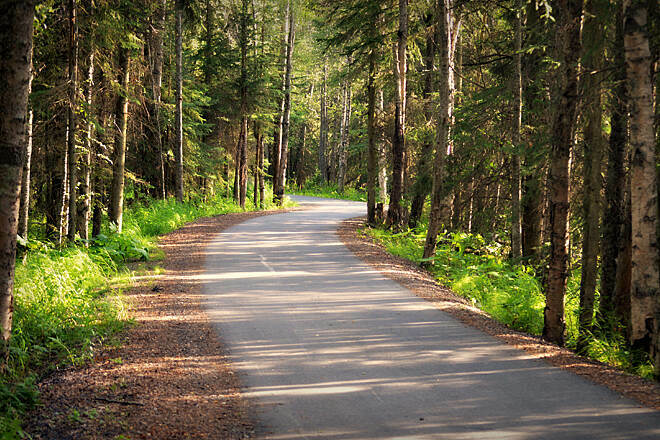 Any cyclist bound for Alaska should not miss this unique trail. "